Whether you shoot an AR-15, a bullpup, a SBR, an AK, or even a bullpup SKS - you know the importance of good optics on your rifle. Red Dot sights are an incredibly important tool in the serious hunter’s arsenal. Red Dot scopes are particularly favored by hunters for their visual superiority when keeping eyes on your prey. Basically what a red dot scope does is produce a single red dot that points at the target you are aiming at. Once the scope is sighted in that red dot (occasionally green for day light shooting) becomes your cross hairs and if you don’t jerk or your target move at the wrong time it is deadly. While you can get a magnified red dot scope the unmagnified tends to work better and are more powerful. For the best shot you can take, Red Dot scopes are preferred by novice and expert hunters alike—with the right calibration, these scopes make taking down the big and small game a sure thing. The following is a list of the Top 5 Red Dot scopes on the market that is ideal for hunters. Available in both Black and Realtree APG Camo, Bushnell’s popular Trophy Red Dot Sight Riflescope (TRS-25, 1 x 25mm) has a tilted amber front lens that uses reflected light create an accurate red dot for ideal sight. 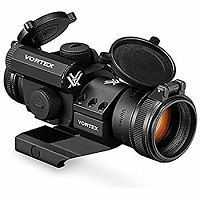 This is unlike conventional riflescopes as the red dot sight is positioned off-axis—this angle allows the light generated by the battery-powered LED light inside the unit to be reflected back. This aiming reference is what makes the modern red dot sight so easy to use and extremely popular among hunters. This scope by Bushnell uses a 1 x 25mm (1x power and 25mm objective lens) red dot for easy target acquisition and has a 3 MOA, dot-reticle. The Amber-Bright high contrast lens coating creates the red dot that is reliable for a perfect hunt. The optics are the highest quality and feature HD clarity of the world around you. The materials are tested extensively to ensure quality and durability. The 3 MOA red dot sight has 11 brightness settings and unlimited eye relief. Included in this purchase is Realtree APG camo-clad protective case that is tough, durable, and camouflaged as not to stand out. The scope is battery powered and includes a CR2032 battery as well as a protective lens cover to keep the amber lens safe from scratching and debris. The scope itself only weighs 3.7 ounces and measures 2.4 inches long. Depending on the color chosen, you can buy this Bushnell red dot sight. The Aimpoint PRO Patrol Riflescope incorporates features to maximize the sight’s performance. 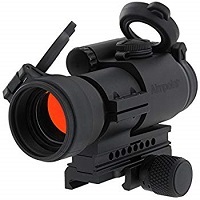 The Aimpoint PRO’s front lens was constructed with a special coating, which allows the rifle sight to be used with all types of night vision devices. The rifle sight’s modular mount includes a removable spacer that indexes the sight at the optimal height for co-witness with the standard iron sights on AR15/M16/M4 carbine-style guns. This spacer can be removed if desired to enable the use of the sight on police shotguns or sub-machine guns. A two Minute of Angle red dot is utilized to allow maximum accuracy at all distances and under all environmental conditions. Hard anodized aluminum alloy housing. Threaded front lens opening allows the use of screw-in anti-reflection device (ARD). Transparent rear flip cover allows the use of the sight (with both eyes open) even with both covers closed in an emergency. Battery and adjustment cap retainer straps mean you will never lose your pieces. Modular mount set up for use on flat-top AR15, M4 Carbine, and M16 rifles. Recessed lens openings help prevent against impact damage, fingerprints, and scratches. Applications for the Aimpoint PRO Patrol Riflescope include: Law Enforcement carbines, rifles, shotguns and sub-machine guns. The FastFirst 3 is the next generation these sights. The FastFire III version is an upgrade of the very popular FastFire II model. The Burris FastFire III offers upgraded features over the FastFire II model. Some of the upgrades include windage and elevation adjustments, an easy to use power button that has three brightness settings. The FastFire Red Dot Reflex sight comes from a line of scopes made by the Burris Company located in Greely, Colorado. One of the unique qualities of the Burris Company is that they are known for their excellent customer service. They accomplish their great customer service by always putting themselves in the client’s shoes. They can do this well given that many of their employees are hunters and shooters as well. FastFire sights are designed to be small, lightweight and durable. All FastFire sights are waterproof and shockproof. Due to their lightweight design, there are a variety of mounting options to choose from depending on the type of long range rifle or hand gun that you will be using with this sight. The FastFire 3 products are available with either a 3 MOA or 8 MOA dot size. Also, the FastFire offers an automatic brightness setting and three manual brightness settings. The red dot on this sight can even be seen in bright light like white snow conditions. The automatic setting on sight adjusts nicely to ever changing ambient light conditions. All you have to do is set the brightness to the “auto” setting, and the sight will do the work for you. The battery for this sight is mounted on the top of the sight which easy access for changing the battery when needed. The battery life has been improved in this model compared to previous models. This improvement provides for a super long battery life. The other adjustments on the FastFire sight are located where they are easy to adjust. The FastFire III also has a convenient battery access on the top of the sight which makes it easy the change the batteries when needed. Like the FastFire II, the FastFire III features a rugged steel body construction for extreme durability and is 100% waterproof. Red Dot Reflex sight is so versatile sight that improves shooting accuracy and target acquisition time. The FastFire III can be mounted on several guns including a handgun, shotgun or your favorite hunting rifle. This sight is best suited for use when fast target acquisition is needed like on pistols and AR-15s. This Burris sight holds zero extremely well, and the click adjustments are so easy to adjust that you barely hear the clicks. The size of the red dot is just the right size to place on any target. 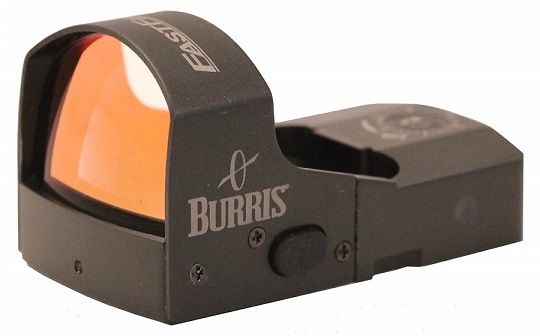 This Burris sight is a high-end performer that matches the performance of much higher priced sights. One of the nice things about this sight is that small and lightweight, yet it is built to be durable. It can also be used on several different types of guns from pistols to long guns. This sight can be on a Benelli M4 Super 90 shotgun, a Ruger Mark III, and on a large caliber handgun like the Ruger Mk111 .22 cal just to name a few guns that can use this sight. 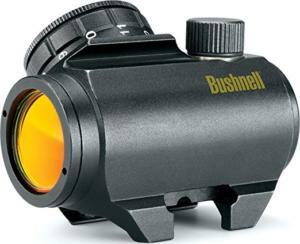 This Burris sight can be purchased at an affordable price that will not bust your budget. You can’t go wrong purchasing this sight because it is one of best sights for the money. I’ve fired 3 top of the food chain red dots in pricing. Those who have tried higher priced sights will tell you that this latest generation of FastFire is an excellent choice. This sight is affordable and performs like a higher priced sight, so why pay more when you don’t need to. Vokul has created a five-starred laser and red dot scope that features protections and superior construction that is ideal for all hunters. With a high-optical clarity at 3-9 times magnification and a 40mm objective diameter, this detachable red dot and red laser scope allow for fast acquisition at close quarters and quick moving targets. The Reticle can be illuminated in both red and green as well as in multiple brightness intensities. With high-quality construction and design, this aluminum constructed sight with the hard anodized finish is durable and reliable for extensive outdoor use. This Vokul is waterproof, shockproof, and fog-proof, with compact red laser sight with the switch. The red holographic dot is perfect to capture fast moving targets such as deer, and the red laser is detachable for hunters who want to fly under the radar. This weather and shockproof scopes are 20 ounces in weight and larger than your typical scope at 12.5” x 3” x 3”. However, while larger than some other more compact sights, this Vokul tactical rifle scope is the perfect attachment for expert hunters. 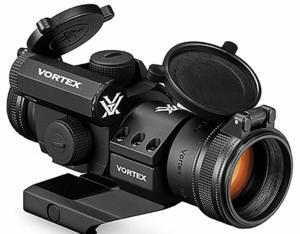 It contains a type 5 MOA brightness control as well as a 22mm aperture for superior sight. This Vokul uses a CR2032 battery, which is included with your purchase. AIM Sports is a brand that offers hunters a cost-effective alternative to more expensive scopes. The AIM Sports Red Dot sight has 4 different reticles and works just as well sights that cost two to three times as much. 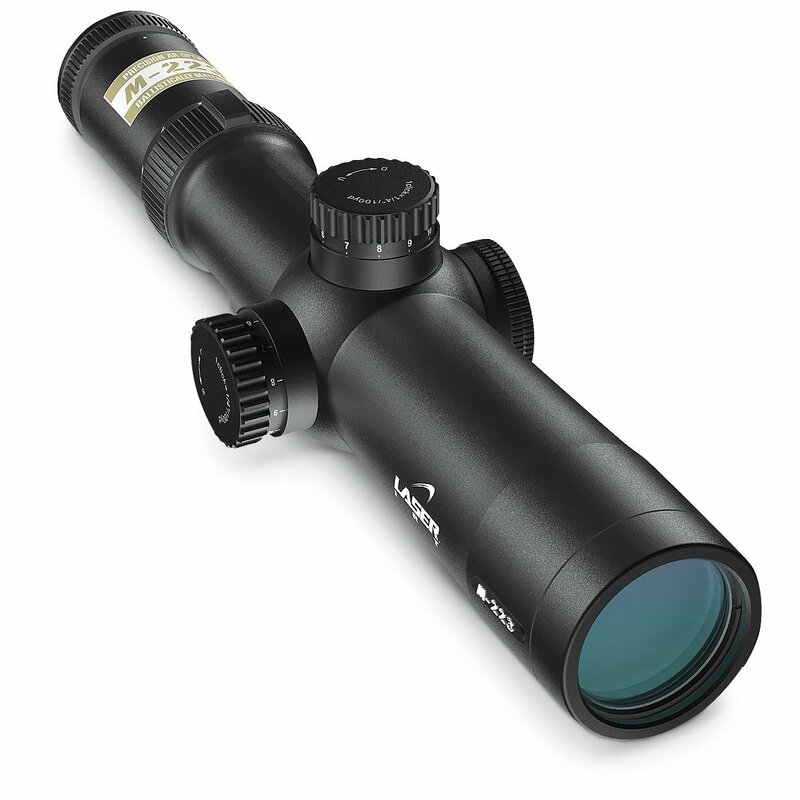 This popular scope features a durable anodized aluminum and is waterproof as well as shock-proof. It contains an open red dot sight with elevation and wind adjustments. There are 4 different reticle patterns to choose from and 7 brightness settings. AIM Sports features a 1x magnification, 24 x 34 objective diameter, 33mm objective aperture, 3-inch length, and is only 4.2 ounces in weight. This lightweight and compact red dot scope is easy to carry in your hunting pack or simply mount it on any standard weaver rail base. For only $25.45 (60% off of retail price), Amazon offers one of the best deals for hunting scopes on the market. 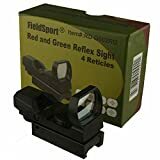 Field Sport’s Green and Red Reflex Sight is another versatile and affordable alternative to larger, more expensive red dot scopes. This open scope features 4 reticles to choose from, depending on your preferences and is a perfect choice for rapid-firing and fast moving targets. This lightweight scope is water-resistant and shockproof, so it will be great for outdoor use and will not break if dropped. These features enhance your performance as a hunter in any environment and climate conditions. The 4 available reticle patterns offer you unlimited eye-relief and corrected parallax. The built-in Picatinny mount base makes for easy mounting, and by using an Allen head screw, you can make windage and elevation adjustments with a locking screw. By adjusting the focus of the scope as well as distance and brightness of lights, you can get a clear reticle for a superior hunt. This affordable red dot scope by Field Sport can be found on Amazon for an incredible price of only $$. This is excellent for hunters on a budget and expert hunters who already have the skill and only want an open scope that is affordable and durable. Made by German manufacturer Umarex, the PS 22 Walther Electronic Red Dot Point Sight projects a red aiming dot onto the lens at the target level. Perfect for hunters, iron sights such as rear or front sights are not required, thus allowing you to aim with both eyes open. 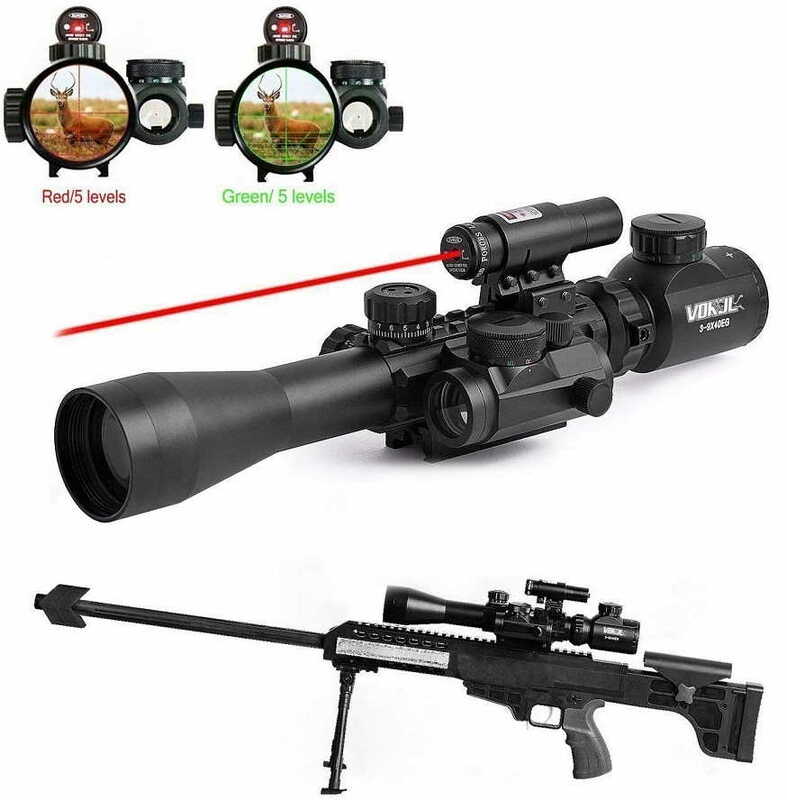 This red dot scope includes a mounting base which can be affixed to a Weaver rail (22 mm), such as on the Walther G22 firearm or a Beretta CX4 Storm firearm. The on/off rotary switch is combined with 11 settings for brightness adjustment and is powered by a single 3-Volt CR2032 battery. Umarex’s Walther Red Dot Point Sight dramatically increases targeting speed in short range shooting situations where fast prey is involved, and for better concentration on the task at hand. At nearly a quarter off of retail price, you can buy the Walther PS22 for only $$. 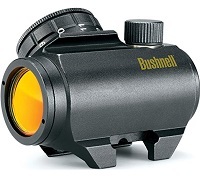 This highly rated scope is rated number 5 overall on Amazon in the Sights and Laser category. Weighing only 5.6 ounces, this compact and lightweight scope is perfect for hunters who are serious about bagging serious big and small game. Coming in a black matte color, this sight is nonobtrusive and has protective lens coverings that will keep this scope safe and scratch-free.